Henry Petroski's previous bestsellers have delighted readers with intriguing stories about the engineering marvels around us, from the lowly pencil to the soaring suspension bridge. In this book, Petroski delves deeper into the mystery of invention, to explore what everyday artifacts and sophisticated networks can reveal about the way engineers solve problems. Engineering entails more than knowing the way things work. What do economics and ecology, aesthetics and ethics, have to do with the shape of a paper clip, the tab of a beverage can, the cabin design of a turbojet, or the course of a river? 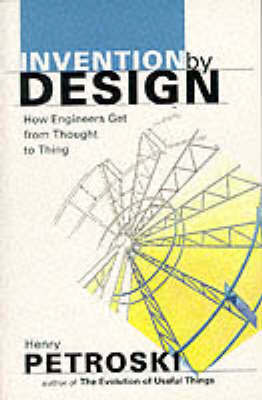 How do the idiosyncrasies of individual engineers, companies, and communities leave their mark on projects from VelcroAÂ® to fax machines to waterworks?Invention by Design offers an insider's look at these political and cultural dimensions of design and development, production and construction. Readers unfamiliar with engineering will find Petroski's enthusiasm contagious, whether the topic is the genesis of the Ziploc baggie or the averted collapse of Manhattan's sleekest skyscraper. And those who inhabit the world of engineering will discover insights to challenge their customary perspective, whether their work involves failure analysis, systems design, or public relations. Written with the flair that readers have come to expect from his books, Invention by Design reaffirms Petroski as the master explicator of the principles and processes that turn thoughts into the many things that define our made world.